Fresh off the back of winning the BAFTA for Best Mini-Series at this year's awards, In The Flesh continues to demonstrate its key strengths, namely that of putting character development at the forefront of everything supernatural that is going on. The tragic tale of Freddie, the small business owner forced into the Give Back Scheme, and Haley's relationship breakdown forms the spine of this episode. It opens with their wedding video and a mournful Freddie reminiscing about happier times. It's easy to forget that Freddie is a PDS sufferer at the beginning of the lock-up scene; it's a classic post-break-up attempt at getting the girl back, complete with apologies and promises to change. Haley's confession that she has grown up and wants something more stable from a relationship wouldn't look out of place in a romantic drama, but here, it's given the added danger of Freddie forgetting his dose. In a beautifully tense sequence, Freddie starts to turn with a jammed door preventing Haley from escaping. The space that had seemed so adorable during its initial moments with its fairy-lights and over-eager romanticism suddenly becomes a claustrophobic ticking time bomb. Camera angles close in on Freddie's decaying face contrast sharply with the wide shots of people trying to get in to the lockup. A seemingly innocuous scene that threatens to erupt into something considerably more dangerous is one of In The Flesh's greatest strengths and it's a moment that sends ripples across the episode, impacting on both developing and fracturing relationships alike as well as both the pro-life and pro-death sides of the argument. Simon and Maxine each represent an extreme of this and Dominic Mitchell has so far been keen to demonstrate their parallels despite their differences. Early in the episode, we get a glimpse of both characters on their own. Simon's prayer alludes to his faith, confirmed later in the episode when he begins to take on a preacher role within the PDS sufferers group. Meanwhile, Maxine's is glimpsed voyeuristically through a keyhole; the audience is not yet welcome into her privacy in the same way that we are afforded Simon's. There have never been outright good and evil characters in In The Flesh; Mitchell's writing has been far too nuanced for such black-and-white interpretations. However, there is a sense that Maxine is losing some of that as her scene portrays her as a little unhinged. There's clearly something in her back story that has caused her to become so extreme, but it appears to be pushing her towards a more two-dimensional antagonist that would jar with the rest of the show. For Kieren, it's another pivotal moment that brings him ever closer to Simon as he becomes increasingly more capable of standing up to those around him. It's been building since the first episode when he stood up to Gaz and gives up his job at the pub to defend Amy and Simon. He's clearly working up to some kind of explosion, suppressing his frustration at those around him in order to keep the peace. But in moments like this, he shows flashes of the anger that Simon can take advantage of in his quest to get Kieren more on his side. That tension is building further, smack bang in the middle of Simon and Maxine's respective machinations and the episode closes by making sure we know exactly which way Kieren is swaying. It's not all doom and gloom though. As ever, the marvellous Emily Bevan provided some much needed levity to the proceedings in her sulky interactions with Phillip, who has managed to make sure she's by his side as part of the Give Back Scheme. Her line reading of 'Village of the damned, how may I help you?" was a big laugh out loud moment and her cheery interactions with Kieren are always amusing to watch. However, Bevan's skill lies in keeping Amy the right side of annoying and there is constantly the underlying sense of something more tragic, whether it's the hand tremor or overhearing Kieren arrive and presumably hearing him kiss Simon. She's the heart of the series and I'm very interested to see how that final scene affects the psychology of her character. Despite the ongoing extension of the show's mythology, this focused episode acts as a stark reminder of the insular brilliance of the first series, entirely enclosed in Roarton itself as the uneasy piece begins to fracture. 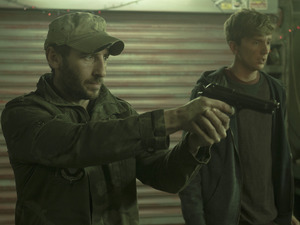 The use of a slower pace to build to that taut final sequence is an excellent example of the way in which In The Flesh goes from small town character drama to horror in a space of seconds and the series continues to go from strength to strength. You can read Becky's review of the second episode here.